The following guide explains how to do basic tasks in the Ozeki Phone System XE by using your ASP.NET application. Get to know how to receive/make voice calls, how to receive/send SMS messages and get started to build more advanced communication projects. Now, let us learn how to manage your calls and messages with an ASP.NET application. 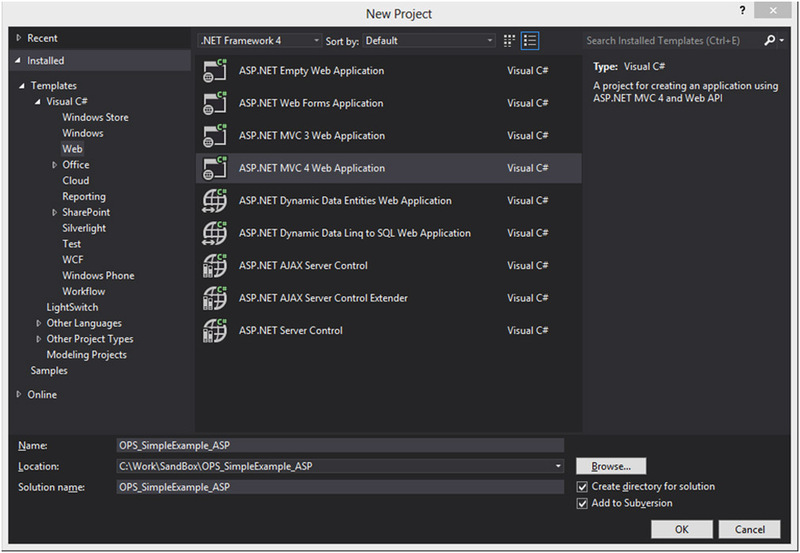 For that, create a new ASP.NET project in your Visual Studio (Figure 1). When you are ready with the steps above add a controller (e.g. HomeController) to your application and make a View for that (Figure 3). Now, if you have made everything right, press F5 for start your project. You will see the empty page in your browser with an “Index” text. You have finished the basic initials steps with your application. Now, you need to install an API extension in Ozeki Phone System XE in order to receive calls and SMS messages. Find out how to install a new API extension. First of all, add API Extension notification to your Ozeki Phone System XE by HTTP API. With that, subscribe to the incoming call event, and here, it is possible to handle your incoming calls. You have the possibility to add customized responses for each call. The easiest way for this, is to define a method in your application (in the HomeController) what will handle the incoming requests and send back the OzML response. So, when the HTTP API Extension receives a call, that Extension will forward the call to your subscribed application. Your application will get the request and it will send back the customised OzML Response (e.g. a text what will read to the caller). In the incoming request you will get information about the call, which information can be found in your parameters of your subscribed method. Read more about these parameters at the following page. See the example method below, which receives the request and sends back the OzML response. Speak tag shows which text will be read. Read more about the applicable OzML commands at the following link. Call the SendRequest method with the address of your PBX and the command with the parameters what you would like to execute with HTTP API. Please change the ozekixepbx.ip text to that ip address where the Ozeki Phone System XE is installed. On the yoursite.com the address should be that where the sample applications are running. Read more about the commands and its parameters at the following page. Use your own address of PBX as the first parameter of SendRequest. With these steps you have done the basics of the call creating in ASP.NET. Every time when the API Extension will send a request to the ReceiveSMS method, the parameters of the request (e.g. the message itself) will be written into a file. Read more about the SendSMS command and its parameters at the following page Meanwhile studying this guide, it is remarkable, that the deliveryReport parameter is an URL, in this case another method in your application. This method will be called by HTTP API, when a delivery report is arrived from your Service Provider. This method can be very simple for example writes all of the parameters into a file.